Grew Up… with a silver spoon in her mouth. Blanche’s family was once prosperous, landed and wealthy, but a series of family deaths devastated the DuBoises. Now, Blanche’s inheritance is gone and her old home, “Belle Reve,” has been taken away from her. Visiting… New Orleans. After being evicted from her home, Blanche has been forced to go stay with her sister, Stella, who lives with her husband Stanley in the city's French Quarter. Profession… a former schoolteacher, Blanche is now unemployed. She was fired for having an affair with a 17-year-old pupil – a secret which she'd like to keep private. Relationship Status… widowed. Blanche’s husband came to an unfortunate end, and Blanche's been trying her best to forget him ever since. Now that she’s arrived in New Orleans, she’s hoping to find a man who will be her saving grace. Challenge… protecting herself from Stella’s brutish husband, Stanley. From the very beginning, Blanche and Stanley have found each other disagreeable. The powerful, animalistic man doesn’t have much patience for the snobby Blanche, and she returns the feeling. “He’s like an animal," Blanche complains to Stella. "He has an animal’s habits. There’s even something subhuman about him." Personality… pretentious, flighty, and insecure. Beneath all of Blanche’s rudeness and self-importance is a woman terrified of aging and losing her looks, one teetering on the verge of a nervous breakdown. Blanche DuBois's popularity ranking on CharacTour is #2071 out of 5,000+ characters. See our top-ranked characters and read their profiles. 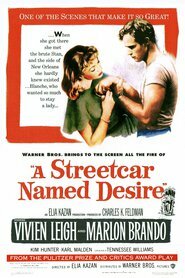 A Streetcar Named Desire is the film adaptation from the play by Tennessee Williams and directed by Elia Kazan. The film tells the drama story of the conflict between run down southern states and the exemplary industrial states in the north. Disturbed Blanche DuBois moves in with her sister in New Orleans and is tormented by her brutish brother-in-law while her reality crumbles around her.